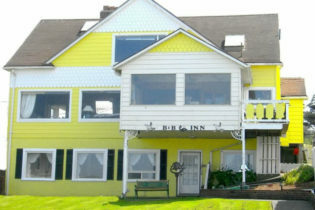 Brey House Bed and Breakfast Inn is located in Lincoln City, Oregon where the mighty Pacific Ocean greets the Lincoln City beach along 7 beautiful miles of shoreline. Our Bed & Breakfast is an excellent location for wave, whale, sunset and storm watching, and the beach is great for collecting driftwood, agates, shells and other oddities. Welcome to Brey House Oceanview Bed & Breakfast Inn, located in Lincoln City on the North Coast of Oregon. 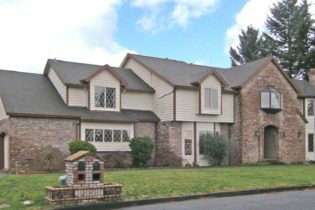 We have a large landscaped yard and off street parking. Fly your own kite or watch the spectacular aerial displays of color and shape at the D River Wayside. Voted the “Kite Capital of the World”, Lincoln City receives steady winds because of there unique location on the 45th parallel. Shopping for kites is also great fun as well as shopping the many varied art galleries, factory outlets, book stores, restaurants, craft stores, antiques, boutiques, and other assorted shopping venues. The guest rooms are beautifully decorated and include wonderful amenities, like queen size beds, private fireplaces, private baths and ocean views. There is a shared guest kitchen and living room for your convenience located on the first floor of the bed and breakfast. The Deluxe Suite for that special getaway, features a private entrance, full kitchen, private pool table and a sitting room with TV. You’ll find everything you need at Brey House Oceanview Bed and Breakfast Inn. We hope you’ll visit us soon! Enjoy your visit at the Chehalem Ridge Bed and Breakfast, located in Newberg, Oregon with over 60 wineries within a 20 minute drive. Step out onto the balconies to views of the breathtaking wine country of the Willamette Valley. 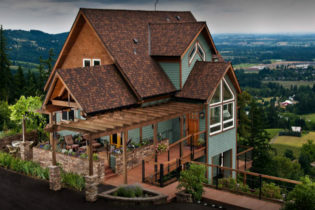 Located in Newberg, Oregon, the Chehalem Ridge Bed and Breakfast is a beautiful 4 bedroom bed and breakfast with the most breathtaking views of wine country in Oregon, with over 60 wineries within a 20 minute drive. While exploring the Willamette Valley in Yamhill County, guests will not run out of things to do. They may enjoy fine dining restaurants, hot air ballooning, golfing, and of course wine tastings at the many local wineries that this magnificent Oregon area has to offer. During their stay, guests have access to the common area’s high definition satellite TV, as well as the guest mini-fridge and microwave. Each bedroom includes memory foam mattresses, bath robes, individual room thermostats, iron and ironing board, and free wireless Internet. Some rooms have private balconies, jetted bathtubs, and fireplaces. A full gourmet breakfast, which can accommodate food allergies, is served each morning for each guest. This inn is ideal for a romantic getaway, honeymoon, or peaceful retreat. Enjoy the views from the balconies while sipping a glass of wine. The Chehalem Ridge Bed and Breakfast welcomes its guests to enjoy the peacefulness and relaxation that they will experience during their stay. Harold and Margaret welcome you to their Willamette Valley Bed and Breakfast, offering a relaxing country atmosphere in Beaverton, Oregon. Experience the natural beauty and wildlife of Oregon while still being within 15 miles of Downtown Portland, one of the most vibrant and dynamic cities in the U.S. Located in the heart of the Willamette Wine Country, which boasts over 300 wineries. Our three uniquely appointed guestrooms have been lovingly decorated in homage to the history, geography, and culture of Oregon. All rooms have private baths, televisions, and free wireless internet access. The Coastal Room is also fully handicap-accessible in accordance with ADA (Americans with Disabilities Act) guidelines. There is so much to do in this area, and we would be happy to help you plan your adventure. Attractions include: Pioneer Square, the Oregon Zoo, Oaks Amusement Park, Portland Art Museum, the World Forestry Center, and much, much more. A visit to Ashland, Oregon is always a very special experience. Your stay at Country Willows Inn Bed and Breakfast will make that experience even more special! Romantic couples, girlfriend’s getaways and families, are invited to relax in comfortable rooms, with king or queen beds, guest phones, high quality cotton towels, high thread count bed linens, cotton robes, and select bathroom amenities. Wireless internet is available throughout all rooms and on the property. A TV /VCR, internet computer, and fireplace can be found in the library den common area of the main inn. To get your day started, head out to explore the property featuring inviting willow furniture on two spacious porches and a heated swimming pool open spring through fall. There’s Hiking on the trails only a few steps away, bicycling the country roads (you may borrow our bikes, of course), and horseback riding at a nearby ranch. Sports enthusiasts may want to consider white-water rafting on the Rogue River, or fishing, boating, and swimming at nearby Emigrant Lake. In winter, cross-country skiing and downhill skiing are spectacular at the Mt. Ashland Ski area. So…treat yourself to “Ashland’s Country Inn.” The quintessential country inn, is snuggled against a rolling hillside on a lush five acres of farmland, surrounded by magnificent southern Oregon Siskiyou and Cascade Mountain ranges. While only less than a two mile drive to the center of Ashland, perhaps you’ll just want to relax at the inn and let us spoil you. Enjoy sweeping mountain views from Adirondack chairs on the lawn…or slip on a cozy white robe and lie back with a good book by the pool or in the comfort of your room… work a puzzle or play a game in the den by the fireplace…and, of course, indulge in our complimentary cookies. 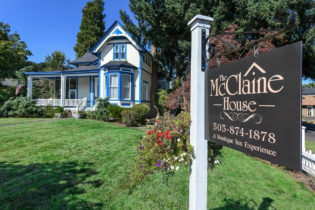 Magnolia Inn, a pet-friendly bed & breakfast located in the heart of historic Jacksonville, Oregon, featured in Sunset magazine is the favorite of visitors, corporate travelers and locals alike. Jacksonville’s Magnolia Inn, a charming Bed & Breakfast located in the heart of historic Jacksonville, Oregon is showcased in Arthur Frommer’s Budget Travel magazine as one of the 10 Coolest Small Towns in America. The entire town of Jacksonville has been designated a National Historic Landmark by the U.S. Department of Interior. During the summer, ride the trolley for a tour of vintage homes and businesses. Take a stroll through the quaint village, and enjoy the amenities Jacksonville offers, including award winning dining, unique shops, hiking, spectacular fall foliage, and convenient to Southern Oregon University. The nearby famous Rogue River offers the excitement of both whitewater and scenic rafting, trophy steelhead and salmon fishing. Crater Lake National Park is a must-see, and is just over an hours drive through scenic forests. Welcome to Mt. Scott Manor, a beautiful modern home inspired by the grand old Tudor manor houses of England. The Manor is placed between a breathtaking mountain view and a private forest complete with resident deer to make the illusion complete. Yet, you are just minutes away from a large, modern city. With the welcome addition of central heating and air conditioning, spacious suites with luxury bathrooms, a gourmet kitchen, wi-fi, and all the modern conveniences we’ve grown to depend on, you get the best of both worlds. The privacy, charm and genteel sensibility of a gracious manor house with the comfort, service and assurances we all want when we travel. 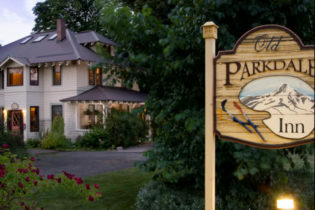 The Old Parkdale Inn Bed and Breakfast is a comfortable and tastefully decorated inn located just fifteen minutes south of Hood River and the Columbia River Gorge in Parkdale Oregon. in the heart of the Hood River Valley. Hood River and the Columbia River Gorge and only an hour and a half from Portland. We are the perfect base for all your favorite outdoor adventures such as geocaching, kayaking, windsurfing, skiing, snow boarding, and hiking. Mt. Hood Meadows, Cooper Spur Mountain Resort and Timberline Ski areas are only a short drive away as is the vast Mt. Hood National Forest where trails and wildlife abound. Drive the 35 mile Hood River County Fruit Loop through forests, vast orchards and welcoming communities. Wineries, alpaca and Lavender farms, family fruit stands and flower farms along the drive. Sandlake Country Inn near Pacific City, OR, has been voted "Most Romantic Hideaway" by Inn Traveler Magazine & "Simply Sublime" by Best Places to Kiss in the NW. 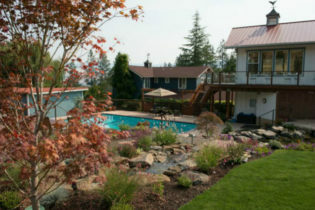 Enjoy your Oregon romantic getaway with double jacuzzi tubs, fireplaces private decks & breakfast delivered to your door. Sandlake Country Inn Bed and Breakfast is nestled on the scenic Oregon coast near Pacific City and offers luxury and privacy rarely found. The B&B features four romantic rooms, most with double whirlpool tubs and fireplaces. The Sandlake Country Inn Bed & Breakfast is perfect for romantic getaways and honeymoons. Our bed and breakfast provides guests with plenty of activities and area attractions’; being close to the ocean provides convenience and intimacy for guests. As a guest at our Oregon bed and breakfast, you will have your choice of several luxuriously appointed travel accommodations. There are three private suites available in the Inn, and there is a creek side guest cottage located on the property as well. All rooms include private bath with whirlpool tubs & showers, robes, CD player, TV/VCR/DVD and small refrigerators (large refrigerator in Cottage). A beverage station and our fabulous cookies are available 24 hours a day. 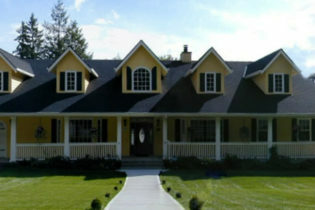 Now on the Oregon Historic Registry, Sandlake Country Inn Bed and Breakfast waits to welcome you. 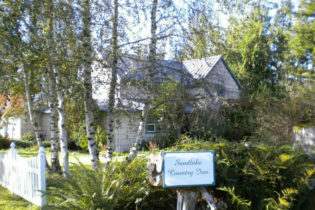 We invite you to leave stress behind and experience the romance and seclusion of Sandlake Country Inn Bed and Breakfast. Welcome to The McClaine House A Bed & Breakfast in Historic Downtown Silverton, Oregon. We invite you to The MClaine House nestled in the picturesque town of Silverton, Oregon where you will find beautiful gardens (it is The Garden City after all), waterfalls, art, and history combine with well-maintained homes, a historic downtown area with local, one-of-a-kind businesses, and dozens of hand-painted murals, welcoming parks, and a farmer’s market with plenty of local bounty. Silverton is brimming with small-town charm, and just steps away from it all is The McClaine House Bed & Breakfast, where classic, traditional charm live in harmony with modern amenities designed for your ultimate comfort, enjoyment and convenience in this Victorian style of architecture home, built by “Jake” McClaine and his wife, Sophronia in 1878. Jake was a well respected, prominent Silverton banker in the late 1800s, and along with his partner Al Coolidge opened the Coolidge and McClaine Bank on Main Street in Silverton. The house was inherited by their daughter Minnie, and her husband, Dr. Keene who helped found the Silverton Hospital in the early 1900s. 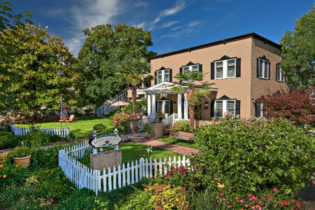 The McClaine House is located steps away from historic and bustling downtown of Silverton with numerous restaurants, breweries, shops, a historic theater that features first run movies, colorful murals, and just up the street, the Coolidge/McClaine Park, home to numerous spring and summer festivities. A short drive from the Inn are the Oregon Gardens, wine tasting, Silver Falls State Park, and the earthen reservoir for more summer fun.